Adventurous souls who climbed to the top of the Pyramid of Power during Ganon's reign could observe a once-perfect world that had been devastated by a powerful villain. The Triforce, hidden inside, was captured by Ganon and used to bring darkness to the world. 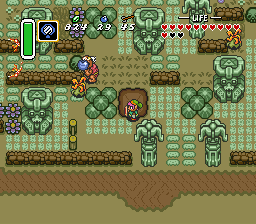 It is said that the evil soldiers who guard Ganon's Pyramid of Power are well-armed. That could account for the presence of a Bomb Shop and a Weapon Shop found in the vicinity. Also in the area is a ghostly garden, several large trees, and a cave where a former citizen of the Golden Land hides from the soldiers. Some trees in the area are armed with Bombs and clues for those who dare to walk near. 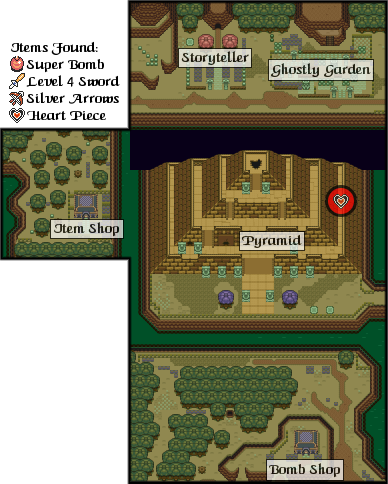 If someone could warp from the Dark World to the Light World while standing on top of this Pyramid, that person would then appear on the roof of Hyrule Castle, near the door to the tower where Agahnim performed his many experiments. Important battles between good and evil forces take place in both of these locations. There is a crack in one portion of a Pyramid wall, but that portion of the wall has been heavily reinforced, as if someone tried to seal someone inside on the other side. Regular bombs do nothing to expand the crack, but perhaps something stronger can. 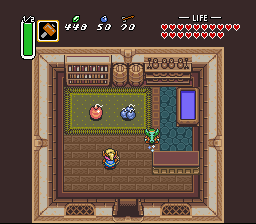 The going rate for Bombs at the Bomb Shop is up to 30 Bombs for 100 Rupees. The storekeeper will sell them only to buyers who can hold more Bombs than they are already carrying. If adventurers are already holding as many Bombs as they can carry, they are advised to come back later. He also provides heroes with a Super Bomb which can break away the thick walls of the Pyramid. This powerful device will be made available after the fifth and sixth Dark World dungeon (Ice Temple and Misery Mire) has been completed. Even though they were reportedly available elsewhere for a drastically reduced price, strong Red Shields are sold at this shop for 500 Rupees apiece. Other wares available in the shop include Fairies for 10 Rupees and 10 Arrows for 30 Rupees. Customers are required to jump over a fence in order to enter the shop. The former Golden Land Cemetery is haunted by Bomb-throwing birds and armored ghosts. Adventurous souls would often battle the ghosts, turn over rocks, and pull up the brush, yet no items of real importance were ever found. After hearing the stories of warriors coming back from the garden with nothing but wounds, smart explorers would pass by the garden and let the ghosts rest in peace. You won't be able to visit it until you collect the Magic Hammer. The hermit in the cave just north of the Pyramid is said to be hiding from Pyramid guards. For a price of 20 Rupees, this man-animal will let adventurers know that no number of normal Bombs could blow open the cracked wall of the Pyramid. Pieces of Heart Containers can be found in the Dark World just as they are in the Light World. Some can only be found by warping from the Dark World to the Light World. In this region, you can find one of both. Those adventurers who investigate the Pyramid diligently will find a Piece of Heart tucked away on the right side of the Pyramid. You'll have to jump down from a higher ledge in order to reach it. An even more difficult heart to locate can be retrieved from the northern ledge that overlooks the Ghostly Garden. At first, it appears to be an empty ledge. By making use of the magic mirror, however, you will be transported to an unreachable ledge over the Hyrule Cemetery that contains a cave opening. Explore the inside of the cave. Beyond the hallway full of pottery, you will find another Piece of Heart. After receiving a message in Misery Mire that you can now buy a new sort of Bomb, head for the Bomb Shop in the Dark World. When you arrive, you will notice that they are having a sale. 30 Bombs for only 100 Rupees! Better yet, the odd-looking shopkeeper will have a Super Bomb in stock. You may not know what to use it for, but it sounds useful, so buy it for 100 Rupees. You must haul the Super Bomb along behind you. You can still fight, but the Super Bomb will prevent you from Dashing because detonates it. You must look for a suitable site to blow it up. If you accidentally detonate it, you can return to the Bomb shop and buy another. From your earliest explorations of the Dark World, you might have wondered what was hidden behind the cracked, dark block on the Pyramid of Power. You may have tried bombing it, Dash Bashing it, and hitting it with your Sword. Nothing works. Nothing, that is, until you try using dragging the Super Bomb to the Pyramid. Set it on the ground in front of the crack and detonate the device. A tunnel will be revealed. 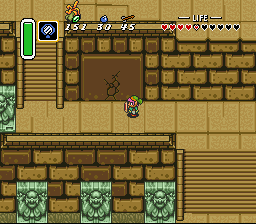 Inside, you will find the Fairy whose beauty was stolen by Ganon's power. Like the fairy in the Waterfall of Wishes, she will return the items that you throw into her pond if you are honest. This fairy, however, can upgrade two extremely useful weapons in your possession. If you succeeded in upgrading your Master Sword to the tempered Level 3 sword, you can throw that into the pond and receive the ultimately powerful Level 4 sword. In addition, if you throw your bow and arrow set into the pond, they will be returned as a bow and silver arrows (any arrow you collect from that moment on will also be silver). These silver arrows are the only weapons capable of defeating Ganon. This page was last edited on 30 September 2017, at 19:20. This page has been accessed 97,170 times.